Staff photo by Steve Muscatello New Ulm Cathedral’s Josie Pautzke (16) spikes the ball past Lillian Maul (1) of Madelia Thursday at CHS. NEW ULM — The first-game jitters were apparent between New Ulm Cathedral and Madelia on Thursday night, but it was the Greyhounds that shook off the most of those jitters with a 3-0 sweep victory in nonconference volleyball action. Cathedral won the match 25-23, 25-15, 25-21. Set 1 was arguably the most competitive set of the night, as both squads worked off the rust and got a feel for each other. Three straight points for Madelia led to an early 10-6 lead and a Cathedral timeout in the opening set. The Greyhounds climbed back within 1, 10-9, before Madelia went on a 4-0 run that was capped off with a kill by Rachel Schultz to give the Blackhawks a 14-9 advantage. The Greyhounds, however, applied pressure and went on a 7-0 run to lead 18-15. With the Greyhounds up 22-19 after a kill by Karlie Gieseke, Madelia tied it up after a block by Alayna DeLaCruz and a Cathedral error. The Greyhounds wrapped up Set 1 with a win on a kill by Josie Pautzke and a block by Sarah Mohr. The Greyhounds then turned it up in the second set and buckled down in comparison to the first set. They first stormed out to a 10-5 lead after a Pautzke kill. Cathedral later took a 17-8 lead after a Blackhawks hitting error, the Greyhounds’ largest lead of the set. Madelia was only able to get within 6, 19-13, the rest of the set. The third set was neck and neck until three straight Cathedral errors gave Madelia a 10-7 lead. Trailing 13-10 after a block by DeLaCruz, Cathedral went on a 9-0 run to lead 19-13 after a kill by Mohr and a Madelia attack error. The Blackhawks battled back with a 4-0 run to trim the deficit to 19-17 and force a Greyhounds timeout. Two points was as close as Madelia would get, though, before Cathedral put things away early. Madelia head coach Steve Schlager said that too many errors led to his squad’s downfall, but he expects them to rebound from the tough, season-opening loss. Wilfahrt, watching her team take the floor with just nine active varsity players, was proud of how her team handled the pressure. Pautzke led the Greyhounds with five ace serves, two digs and two kills, while Lily Franta, Maggie Fliszar and Mary Herzog added two kills apiece. 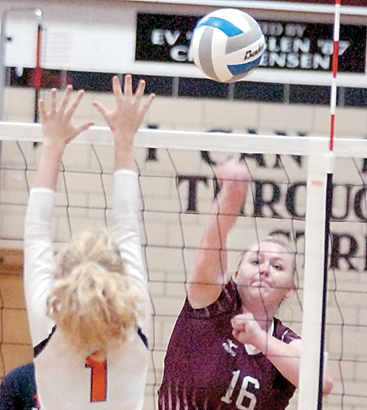 Mohr had four blocks and two digs, while Gieseke had six set assists and two digs. For the Blackhawks, DeLaCruz had 10 kills and four blocks, while Faith Bergeman had 15 set assists and three ace serves. Schultz added five kills, while the 6-3 Blair Van Zee had four kills and two blocks. 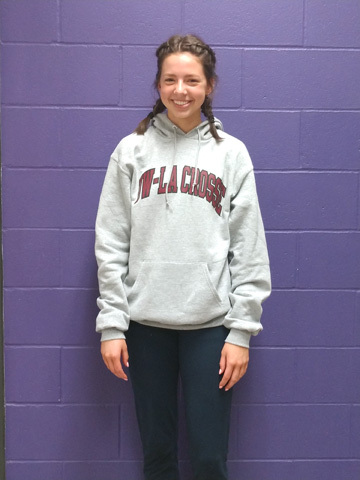 Jude Frelich led Madelia in digs with 15, while Lilly Maul added five. Cathedral (1-0) hosts Cleveland at 7 p.m. Tuesday for nonconference action, while Madelia (0-1) is at Cedar Mountain for a 7:30 p.m. nonconference match Thursday.